Last week on Matt’s podcast, I shared a bit about how I stay healthy and fit and how I can possibly manage to be seemingly surrounded by goodies and not eat all of them. If you haven’t listened to the episode, check it out! And never mind our weird married couple interaction. This was essentially a regular conversation we had while a microphone sat in front of us in our living room. On a Saturday night (#ourweirdlife). 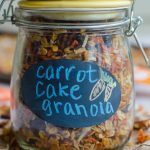 Another way I (we) manage to to combat eating every single goodie that comes out of my kitchen is to fill our cabinets with healthy snacks and healthiER versions of our favorite indulgences. A few weeks ago, Matt actually showed me this product he had discovered on IG called BuffBake. 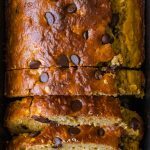 BuffBake is a company run by two women (hi, Ashley and Brittany!) that produces all-natural, high protein, yummy-flavored nut butters. They have both peanut and almond butters, both of which are boosted with whey protein and “enhanced” with chia and flax seeds. 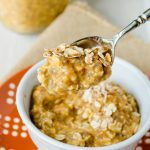 Matt found them among his fitness world and thought I would take some interest in them as well because, hellooooo, you know I love my homemade nut butters! 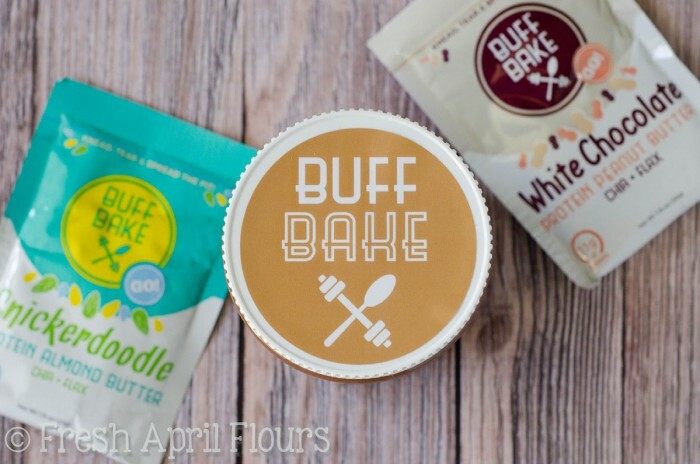 We wanted to try some of BuffBake’s products, but were also interested in working with BuffBake in some way for either of our blogs. A few emails later, Ashley and Brittany sent me a jar and some sample packs of their dreamy almond and peanut butters. We have since purchased 2 more jars (coffee bean and red velvet <– OMG FAV). 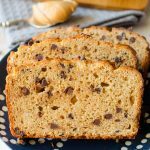 I wanted to use some BuffBake in a creative way, but also in a recipe we would actually keep around, that could work as content for both of our blogs, and that would showcase BuffBake’s tasty and nutritious nut butters! Also, remember this? Yeah. Oat city over here at the April digs. But… I highly suggest getting some BuffBake. COOKIE ALMOND BUTTER, GUYS. 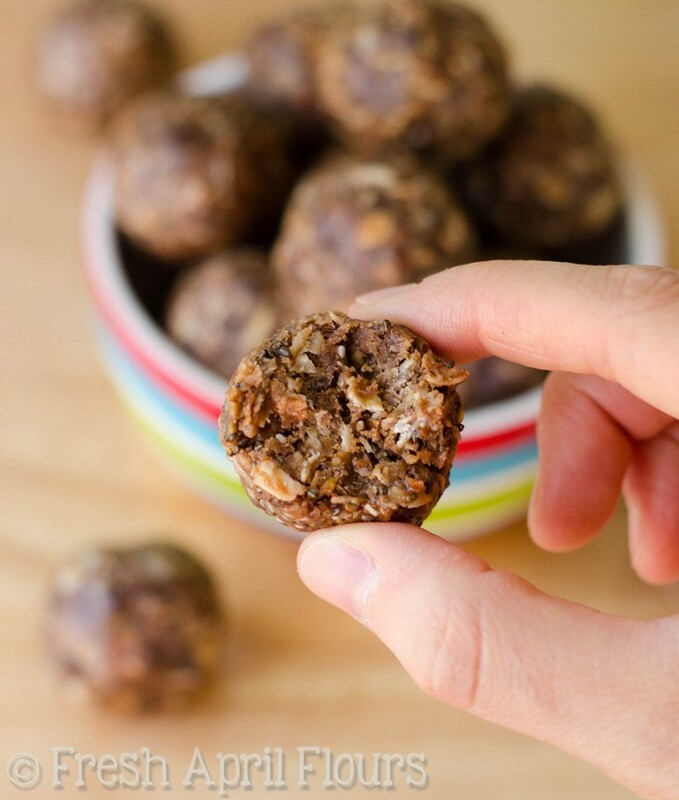 I put these energy bites together using wholesome, good-for-you ingredients (plus some chocolate chips, but mini, so… Healthy?!). While I loveeee me some dessert, I stand firmly behind moderation and that dessert is a sometimes food. These energy bites fit the bill for both! 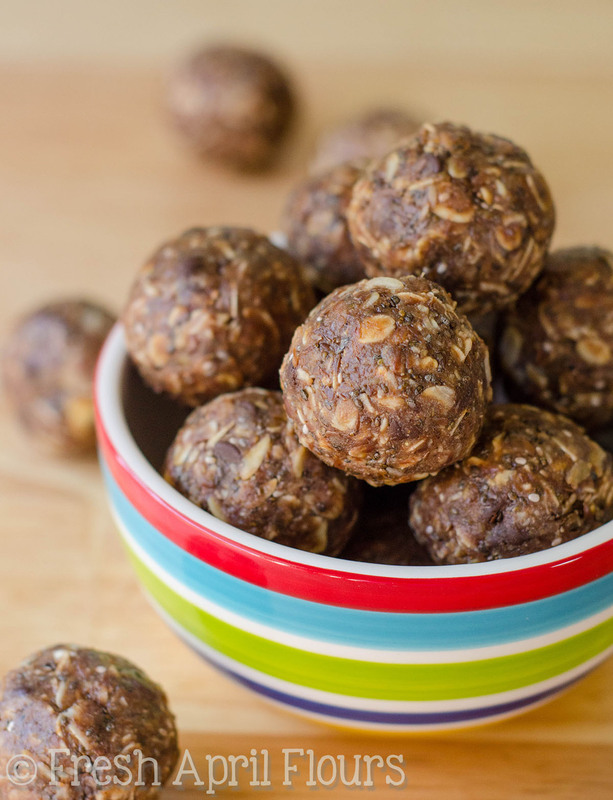 While each bite is jam packed with nutrient-rich ingredients (nuts, whey protein from the BuffBake, flax seeds, chia seeds), they absolutely do not taste like cardboard. I repeat– this blog will never guide you in the cardboard direction. Healthy + appetizing = necessary. The only sweetener I added to these energy bites is honey. No sugar, no artificial sweetener, just wholesome, natural sweetness. You can feel good about that right? You should feel FABULOUS about this, because these tasty little treats will be your new favorite purse snack! Guys… Do guys read my blog (? )… I’m sorry you don’t have a purse to put your bites in. But if you’re married or have a lady friend or a companion who carries some sort of bag or fanny pack or extra large pockets… You NEED THESE IN IT. 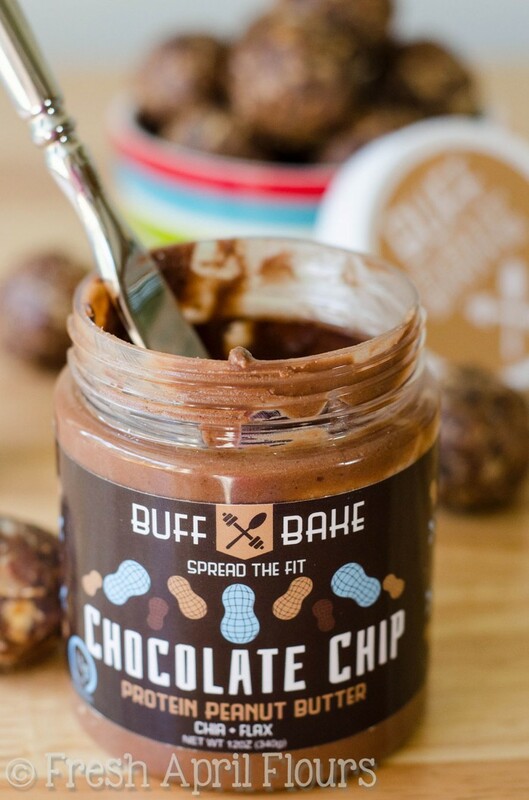 And now, the best part of all of this… BuffBake wants YOU to try some of their peanut and almond butters at a discount! Just use the code freshaprilflours at checkout to receive 10% off of your order! SWEET, right?! 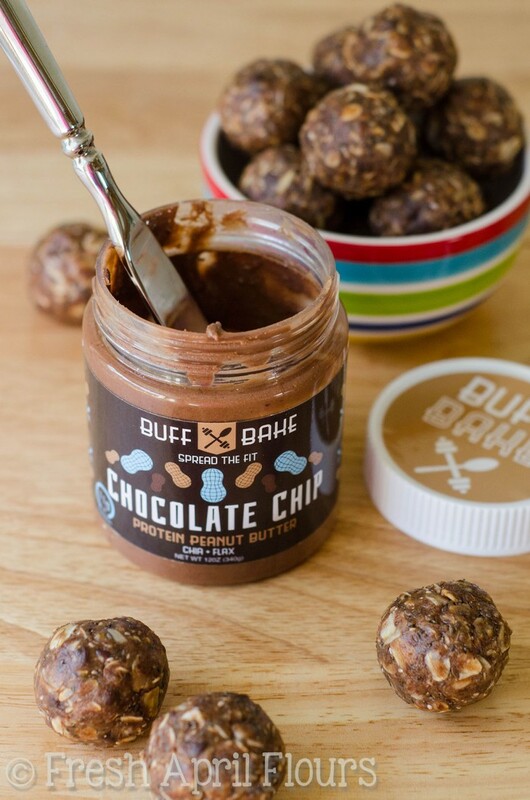 Whether you choose to purchase some BuffBake or not, these chocolate chip energy bites are the perfect addition to your on-the-go snacking arsenal, a treat in your lunch box, or simply a dessert or snack you can feel better about! 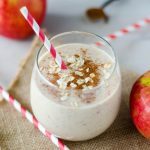 Customize them with your favorite flavorings, change up the nut butter, roll them in cocoa powder… However you choose to enjoy them, I think you’ll find them easy, convenient, and best of all– nutritious. 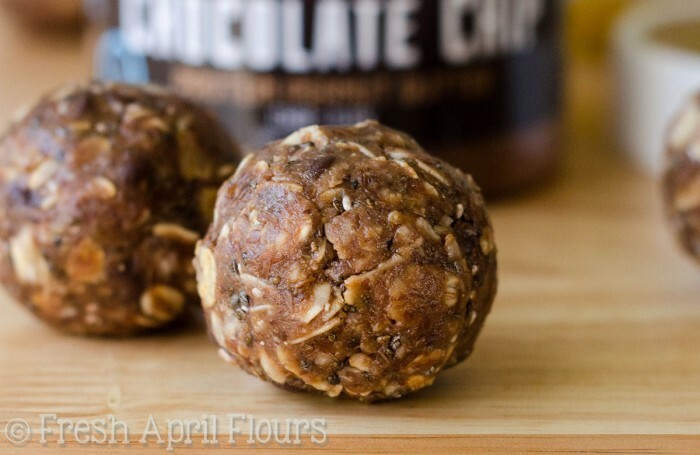 Chocolate chip oatmeal bites loaded with high protein nut butter, flaxseed, and chia seeds to help fuel you on the go or aid in guilt-free snacking! Line a small baking sheet or plate with parchment, foil, or a silicone baking mat. Set aside. 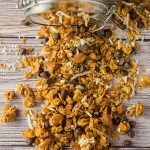 In a medium size bowl, combine all of the ingredients and chill in the refrigerator at least 45 minutes and up to 2 days. Using a cookie scoop, roll into 1" balls and place on prepared baking sheet or plate (I used a kitchen scale and weighed each ball as 1.0 ounce). Refrigerate until set (approximately 15 minutes). Bites can be stored in the refrigerator in an airtight container up to 2 weeks. *You may use plain natural (as in only peanuts, no sugar or oils added) peanut butter instead. Add a scoop of whey protein to keep protein content up. “Healthy + appetizing = necessary.” AMEN, sista! (also, LOVE Brian Regan!). 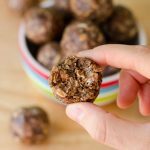 These bites look SO yummy and I am a BIG FAN of healthy, yummy purse treats 🙂 Definitely going to whip some of these up, right after I order some of these Buff Bake nut butters. The Coffee Bean one is gluten-free? HECK YES!!!!!!!! Umm, HOLD THE PHONE. You like Brian Regan?! No one EVERRRRR knows who he is!! I LOVE HIM! I have that whole standup routine on DVD and my BFF and I laugh until we basically pee our pants every time we’ve watched it together. GAH! Anywayyyyy, yes. You will LOVE BuffBake. We are seriously addicted! That Coffee Bean Butter sounds exactly what I’ve been missing in my life! Yes, totally, Amy. That one is SO good. I will be recreating it in my kitchen in the near future!! What’s the serving size for these yummy looking bites? Elsa, as stated in the recipe, my bites were 1 ounce (weighed on a scale) each. Enjoy!